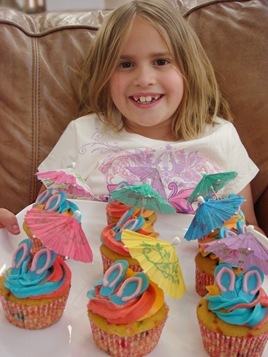 Especially when turning “8” comes with edible flip-flop adorned rainbow cupcakes. Earlier this month was my baby girl’s eighth birthday. Unfortunately, due to a bout of the flu on birthday party day, we had to postpone celebrating until last weekend. With these cute cupcakes, our Hawaiian luau was a great success! 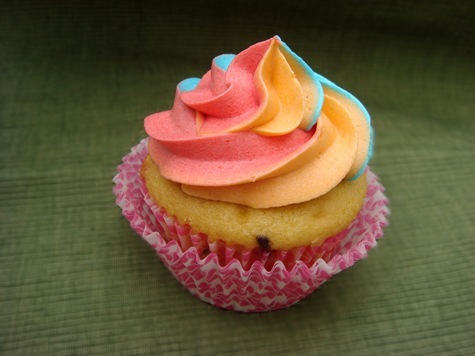 We used this Vanilla Frosting Recipe to frost the rainbow-sprinkle-filled cupcakes. Buttercream or Swiss Meringue Buttercream would also work well. 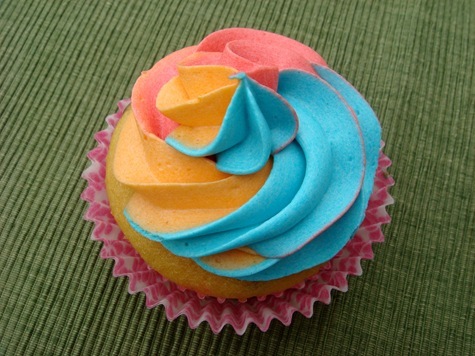 The swirl was made using a Wilton 1M tip. Prepare frosting and divide into 3 bowls (or as many colors as you are using). Tint each bowl with paste or gel food coloring. Place each color in a separate piping bag (or use Ziploc bags). Don’t fill bags all the way. An easy way to fill piping bags is to place the empty bag in a tall drinking glass and fold the top of the bag over the edge of the glass. Spoon frosting into the bag. Secure tops of the filled bags using a rubber band or clip. You can secure them together or separately. Cut ends off of the bags. DO NOT put a piping tip on these bags. Place a large tip (I used a Wilton 1M) on a separate clean bag. Place your frosting filled bags into the empty bag with the tip. Make sure that the ends of the frosting filled bags go into the tip of the empty bag. Don’t fill the frosting-filled bags too full, or they will not fit well in the empty bag. You will probably need to refill the bags before you are done frosting all of the cupcakes. To refill bags, place the entire set of frosting bags (leave them inside the bag with the tip) in a tall drinking glass. Remove rubber band or clip. Fill each bag with an equal amount of frosting. Re-secure the ends of the bags. 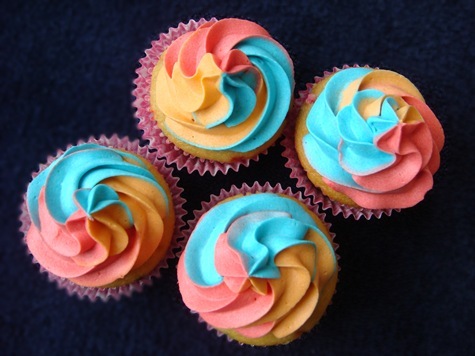 This technique also allows you to easily switch the frosting-filled bags to a different sized tip, if you want to create different effects on your cupcakes. Happy Birthday Little J! Love you always!